Step right up to the amazing Circus Slide Show! 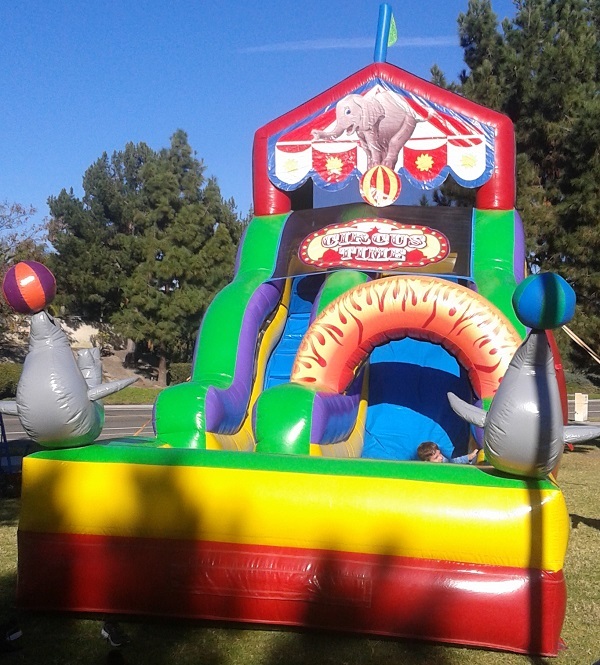 Perfect for Carnival or Circus themed events, our 18ft Circus/Carnival Slide offers a thrill-filled day and keeps the kids sliding.Our Circus Slide features four circus animals and fun bright colors. Two large gray seals with colorful beach balls balanced on their noses welcome your guests to the ‘greatest slide on Earth! As they climb up to the colorful ‘big top’ they’ll see an elephant balancing on a ball under a tent and flag. 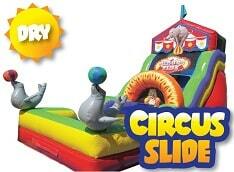 Finally, when they slide they’ll ‘jump’ through a ‘flaming’ ring along with a friendly leaping circus tiger! This bright and colorful red-yellow-green-blue scheme fits into any decor. Looking for the Waterslide version of this slide? Check out our Circus Waterslide! Capacity: 2 participants, up to 150lbs per person. Max 300lbs. Throughput: 240 participants per hour. Minimum space: 30L x 16W x 20H.